Manufacturers & Suppliers of SS 441 Pipes, UNS S44100 Seamless Pipe, DIN 1.4509 Stainless Steel Tubing in Mumbai. ASTM A731 / A268, UNS S44100, DIN 1.4509. Stainless Steel UNS S44100 Pipe, WERKSTOFF NR. 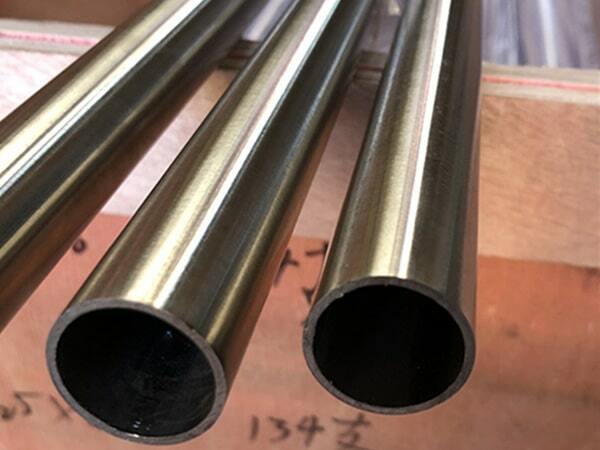 1.4509 Tubing, SS UNS S44100 Pipes, ASTM A268 SS 441 Tubing, ASME SA731 SS TP441 Seamless Pipes, SS DIN 1.4509 Pipes, ASTM A731 Stainless Steel 441 Pipes, SS UNS S44100 Welded Pipes, Stainless Steel 441 Heat Exchanger Tubes Supplier in Mumbai, India. Stainless Steel 441 Pipe, TP441 Pipe Price, SS 441 Capillary Tubes, SS TP441 Rectangular Pipes, Inox 441 Pipes, SS TP441 EFW Pipes, SS 441 Electric Fusion Welding Pipe, SS 441 Round Tubes, ASTM A731 Ferritic Stainless Steel 441 Pipes, SS 441 Tubing Exporter, 441 Stainless Steel Pipe, SS 441 Welding Pipes, SS 441 Square Tubes, SS 441 Electric Resistance Welded Tubing. Are you searching to buy a stainless steel pipe for you varied requirement? If yes, then Stainless Steel 441 Pipes is the best choice for you. Grade 441 of stainless steel is dual stabilized ferritic in nature with 18% chromium content and has low carbon content also. This grade exhibits features such as high-temperature strength, good corrosion resistance, and good oxidation resistance at elevated temperatures and holds various features as compare to its previous grades. This pipe can be formed using a wide range of roll forming, mild stretch bending, and common drawing operations. » Kitchen catering applications such as sinks extractor hoods, shelving, work surfaces etc. » Elevator panels, doors, frames, clamps etc. These are some applications of Stainless Steel 441 Pipes. There are many suppliers and exporters available in the market but Jayesh Metal is the best choice for you. They are using raw materials to make this pipe item and they are using advanced technology to build this. This pie is design as per ASTM, ASME, and other equivalent standards. We manufacturing this material as per client specific demand and meet all the norms of various industries. Before dispatching end product to the client it is well tested on various parameters to ensure the product quality. We are providing safe packaging, we covered this material in wooden case or box to avoid damage or rust during transportation. stainless steel 441 pipe grades chart, stainless steel 441 tubing 3/8, jindal ss 441 pipes price list, 441 stainless steel pipe schedule 10, stainless steel 441 weight chart pdf, 441 stainless steel pipe price list, 441 stainless steel pipe price list, jindal stainless steel 441 pipe price list, stainless steel 441 tubing sizes, stainless steel 441 tubes exporter in india, ss 441 pipe supplier in mumbai, schedule 40 stainless steel 441 pipe dimensions, stainless steel 441 pipe manufacturers in mumbai, schedule 40 441 stainless steel pipe pressure rating, tp441 stainless steel pipe, 441 stainless steel pipe dimensions, 441 stainless steel tubing, ss 441 pipe manufacturer in mumbai, stainless steel 441 rectangular tubing, stainless steel 441 pipe price per foot, stainless steel 441 pipe prices, 441 stainless steel pipe schedule 80, schedule 160 stainless steel 441 pipe, stainless steel 441 pipe manufacturers in india, 441 stainless steel pipe specifications, 441 stainless steel pipe price list, ss 441 seamless pipe suppliers in mumbai, schedule 40 stainless steel 441 pipe, 441 stainless steel pipes dealer in mumbai, 441 stainless steel pipe prices, ss 441 pipe weight chart, stainless steel 441 pipes supplier in india, ss 441 pipe schedule chart, 3" stainless steel 441 pipe, stainless steel 441 pipe specifications astm, stainless steel 441 pipe manufacturers in chennai, stainless steel 441 pipes supplier in kapurthala. Bolivia, New Zealand, Mexico, Lithuania, Japan, Nepal, Chile, Poland, Iran, Saudi Arabia, Czech Republic, Hong Kong, Bulgaria, Iran, Namibia, Greece, Ghana, Belgium, Tibet, Switzerland, Costa Rica, Morocco, Azerbaijan, India, Macau, Trinidad & Tobago,Tunisia, Afghanistan, Libya, Sweden, Oman, Bahrain, Israel, Spain, Portugal, Egypt, China, Vietnam, United Kingdom, United States, Finland, Slovakia, Serbia, Norway, Brazil, Indonesia, Ireland, South Korea, Argentina, Bhutan, Zimbabwe, Turkey, Qatar, Denmark, Canada, Gabon, Thailand, Pakistan, Peru, Colombia, Kazakhstan, Nigeria, Puerto Rico, Ukraine, Belarus, Sri Lanka, Yemen, Philippines, Ecuador, Russia, South Africa, Kenya, France, Croatia, Iraq, Netherlands, Singapore, Angola, Taiwan, Mongolia, United Arab Emirates, Australia, Bangladesh, Italy, Germany, Poland, Estonia, Hungary, Chile, Gambia, Algeria, Malaysia, Romania, Kuwait, Venezuela, Austria, Jordan, Mexico, Lebanon, Nigeria. Ankara, Thiruvananthapuram, Vadodara, Melbourne, Abu Dhabi, Surat, Moscow, Chandigarh, Mumbai, Thane, Bangkok, Istanbul, Montreal, Kuala Lumpur, Hanoi, Navi Mumbai, Doha, Noida, Ho Chi Minh City, Nagpur, Calgary, La Victoria, Muscat, Chennai, Sharjah, Nashik, Ranchi, Madrid, Kanpur, Tehran, Faridabad, Jamshedpur, Atyrau, Ahvaz, Ulsan, Vung Tau, Cairo, New York, Dubai, New Delhi, Jakarta, Granada, Santiago, Courbevoie, Dammam, Kuwait City, Ludhiana, Bhopal, Ernakulam, Rajkot, Jaipur, Hong Kong, Al Jubail, Secunderabad, Geoje-si, Seoul, Howrah, Karachi, Gimhae-si, Kolkata, Lahore, Brisbane, Manama, Perth, Indore, Gurgaon, Bengaluru, Hyderabad, Algiers, Caracas, Ahmedabad, Dallas, Pimpri-Chinchwad, Al Khobar, Baroda, Port-of-Spain, Sydney, Singapore, Edmonton, Houston, Visakhapatnam, Toronto, Rio de Janeiro, Riyadh, Lagos, Jeddah, Mexico City, Haryana, Pune, Milan, Los Angeles, Chiyoda, Petaling Jaya, Busan, Bogota, Coimbatore, Colombo, London, Aberdeen, Kapurthala.